Finnish handset maker Nokia Corporation (ADR) (NYSE:NOK) recently reported its first quarter earnings, and Wall Street freaked out. The stock plunged more than 11% on April 18 after the company reported weaker than expected revenue due to a mixed bag of gains and losses. Let’s pick apart the company’s first quarter results to determine if Nokia is a worthy long-term investment or a falling knife. During the first quarter, Nokia Corporation (ADR) (NYSE:NOK) reported a loss of 272 million euros ($355 million), a major improvement from the loss of 928 million euros ($1.21 billion) it reported in the prior year quarter. However, revenue fell 20% to 5.85 billion euros ($7.6 billion), far below the 6.52 billion euros ($8.51 billion) analysts had been expecting. This means that although Nokia is crawling back toward profitability, its top line has been shrinking due to waning sales of lower-end phones. Total smartphone sales, Nokia’s most widely watched figure, plunged 32% from last quarter. However, Nokia’s cash position – which investors had been increasingly concerned about after Nokia suspended its dividend – still came in at an encouraging 4.5 billion euros ($5.87 billion). Despite all the doom and gloom surrounding Nokia, the company is still the second largest handset maker in the world after Samsung. This strong market share is due to Nokia’s dominance of the “dumbphone” market in developing and emerging markets. At around $20 per phone, however, these low-end phones don’t generate much revenue for the company. That’s why Nokia Corporation (ADR) (NYSE:NOK) desperately needs a successful higher-end smartphone to grow its top line. In 2012, out of those 333.9 million units sold, only 15.9 million were smartphones. On the smartphone front, Nokia has two main products – its flagship Lumia series, powered by Microsoft Corporation (NASDAQ:MSFT)’s Windows Phone 8, and its Asha series, which runs on its S40 operating system. The more expensive Lumia is aimed at developed markets such as the United States and China, while the cheaper Asha is targeted toward emerging markets such as India. Samsung, which shipped 61.6 million smartphones during the quarter, and Apple Inc. (NASDAQ:AAPL), which shipped 36.9 million. In my opinion, those mixed numbers show that CEO Stephen Elop’s decision to center Nokia’s efforts on Windows Phones was the right call. The terrible Asha numbers are simply proof that consumers are no longer interested in a smartphone that runs on an isolated, proprietary operating system, cut off from the exciting world of globally available apps on Google Inc (NASDAQ:GOOG) Android, iOS, or Windows Phone. Therefore, Elop should replace the Asha with lower-end Lumias instead, especially in India, where upper middle class consumers can now easily afford an Apple iPhone 5 or Samsung Galaxy S3. A lower-end smartphone still needs to be a major part of Nokia’s strategy in building upon its brand recognition in global markets, but the Asha was too much like a touch-enabled “dumbphone” than a true low-end smartphone. I believe that Lumia sales would have come in higher if Nokia Corporation (ADR) (NYSE:NOK) hadn’t run into supply issues during the quarter. Demand of Lumia’s flagship 920 was high in China, but the company was unable to meet it with appropriate supply until near the end of the quarter. Those supply issues, along with rising competition from Samsung and Apple, caused sales in Greater China to decline 56% to $334 million, despite its partnership with China Unicom (Hong Kong) Limited (ADR) (NYSE:CHU). With these supply issues resolved, sales of the Lumia series, and its upcoming high-end 928 handset, should get Nokia back on the right track by the second quarter. In addition, Research In Motion Ltd (NASDAQ:BBRY)’s launch of the Z10 during the quarter likely drew away some Nokia users, who generally lean toward products not running on iOS or Android. However, that impact should be marginal at best, since BlackBerry and Nokia tend to cater to two very different demographics – enterprise and retail consumers, respectively. 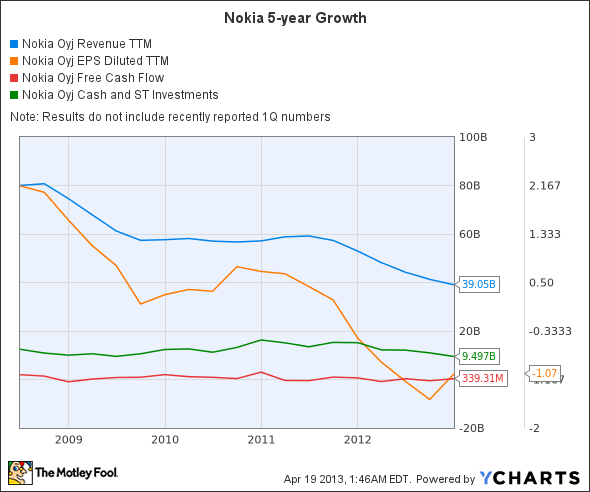 Another problem is Nokia’s lack of margin growth, as seen in this chart. 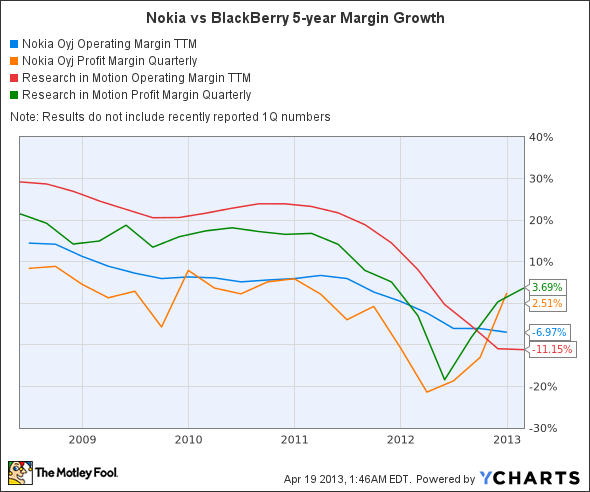 Its profit margin is even weaker than BlackBerry, mainly due to its massive low-end handset business. Looking ahead, Nokia revised its adjusted operating margin for next quarter from 0.1% down to negative 2.0%. In other words, Nokia expects to demand for low-end phones to decline as its smartphone business continues to struggle. Competition from BlackBerry’s upcoming “make or break” Q10, which features its classic keyboard and BlackBerry 10 operating system, as well as Samsung’s eagerly anticipated Galaxy S4, could hurt Lumia sales going forward.